New design UP acrylic diffuser. Comes with suction cup for easy in-tank deployment. This acrylic diffuser is mostly transparent and will not spoil the look of your aquarium. The diffuser has an in-built bubble counter, so it serves two functions in one. The top of the diffuser can be unscrewed to allow the ceramic disc to be cleaned, meaning you get extended life from this diffuser. To use, simply unscrew the top of the diffuser, fill with water (for bubble counter functionality), re-assemble and then place in your aquarium. Push CO2 tubing on to diffuser inlet. Position inside glass of aquarium. Tip: Position just above substrate below the filter outflow. 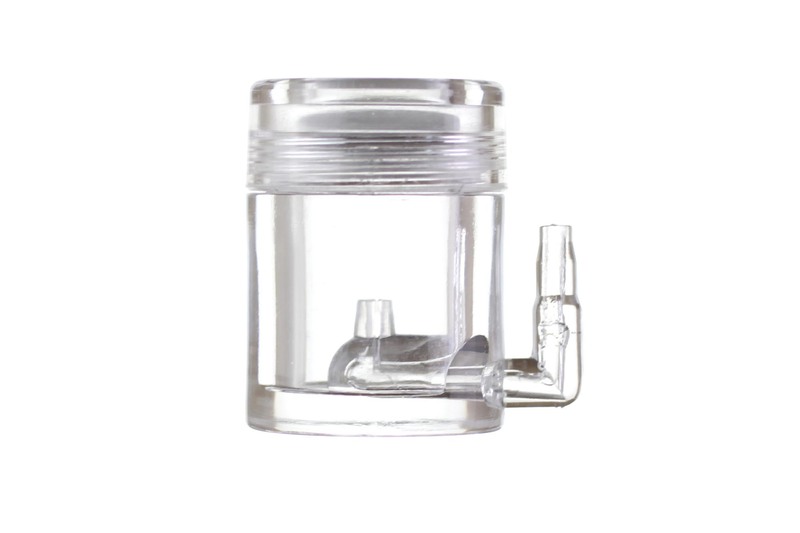 This will ensure the bubbles enter the flow of water from the filter and hold the CO2 in suspension for longer, increasing CO2 diffusion levels. Tip: If using Polyurethane tubing, warm the tip of the tubing in freshly boiled water to soften it when attaching to the diffuser. This will remove the possibility of any accidental damage.